﻿ Success From Home Magazine October 2015 Featuring Zurvita and Zeal for Life! Zurvita Success Stories and Much More! October 2015 Issue Featuring Zurvita and the Zeal for Life Products! 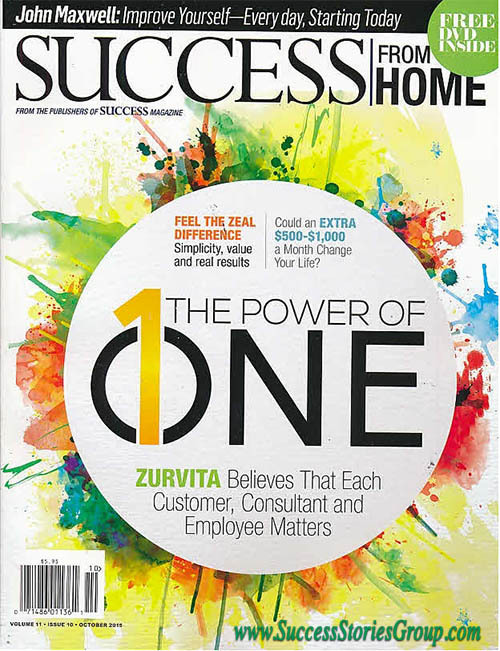 Success From Home Magazine Special Issue: Zurvita - The Power of One! 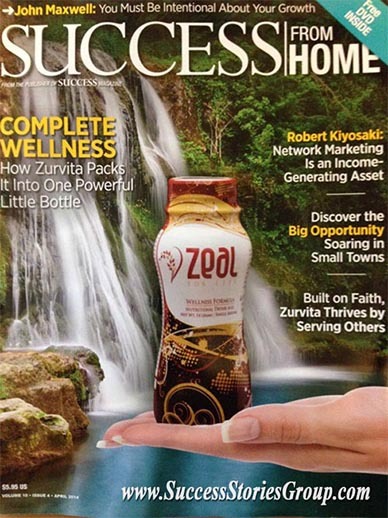 The October 2015 issue of "Success From Home" magazine features Zurvita and the Zeal for Life products. 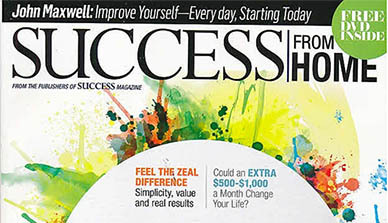 This is the second time in two-years that "Success From Home" magazine has featured Zurvita and Zeal for Life. Why? As you will learn from reading the current (October 2015) and April 2014 issue of "Success From Home" magazine, Zurvita is a simple home-based business that can work for anyone. And as was the case in the last issue, many of the Success Stories are members of the Success Stories Group. The Success Stories Group is the fastest growing group in Zurvita as a result of our methodical training and support system. 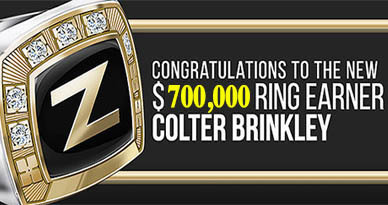 If you are thinking about joining Zurvita, then you want to join Colter Brinkley's Success Stories Group. Get a copy of the October 2015 "Success From Home" magazine from Barne's & Noble or other book stores ASAP! In fact, buy as many copies as you can because when you see the power of Zurvita you will want to join this new and explosive business opportunity. The theme of this current issue is, The Power of One. 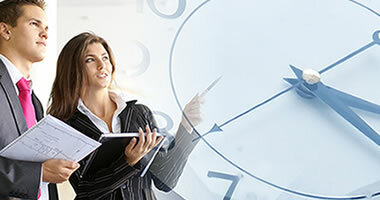 What you will learn in this issue, besides endless true success stories, is that Zurvita has a solid reputation for making sure every customer, Consultant (Distributor) and employee matter. Zurvita, a Business Opportunity that can work for any ONE! If the Zurvita business opportunity is designed to work for anyone, then you can understand the power of one and the powerful duplication that can take place. When you see what the Zeal for Life products can do for people, and how quickly people can earn money from the Zurvita Compensation Plan, you will understand what all the excitement is about. 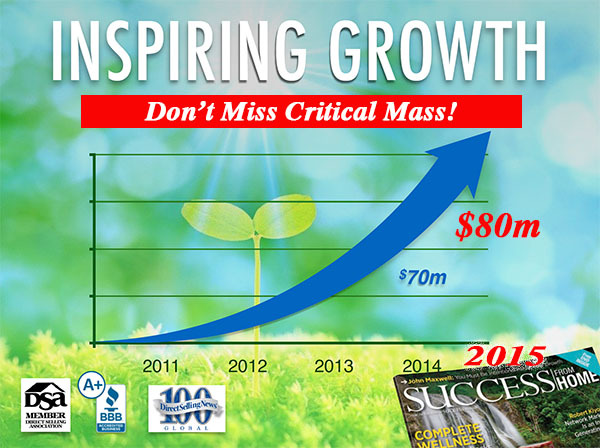 Plus, Zurvita is at Critical Mass! When a solid Network Marketing company does around 50-100 million in annual sales, they are at Critical Mass. 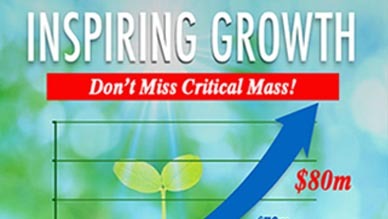 Critical Mass is the best time to join as it is before the momentum or explosive growth phase. This can be worth a fortune to persons that join and build a solid organization. The Zurvita Business Opportunity is at Legitimate Critical Mass! Zurvita ended last year (2016) at 100-million in annual sales. Zurvita is truly at Critical Mass. Don't delay! If you are honestly seeking a home based business opportunity that can be more lucrative than a Franchise, then join Zurvita as fast as you can. If you want to be a part of the fastest growing group, the Success Stories Group, then make sure you join our team. Ask anyone on our team, we have the best training and support in the industry! In addition to Critical Mass and a comprehensive FREE training and support system, you also get Zeal for Life! Zeal for Life is a unique nutritional wellness formula that can actually sell itself. 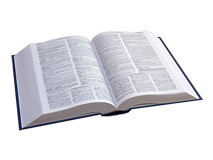 When you see what this amazing product can do for people, it will bring tears to your eyes. Do you want to download the April 2014 issue of "Success From Home" magazine? To get a FREE PDF of the April 2014 issue of "Success From Home" magazine, Click Here! Do you want a more information about the Zurvita Business Opportunity? Zurvita Global International Expansion is beginning! Call the person that introduced you to Zurvita and ask for 2 FREE Zeal for Life wellness samples and a hard copy of the Zeal Science Update Report! This is critical! You need to see for yourself how amazing this product really is. Feeling a difference is just the beginning for many people!